Wash and remove the green tough outer leaves. Leave the core (stem) intact. Cut out the base so that it can stand up without moving around. 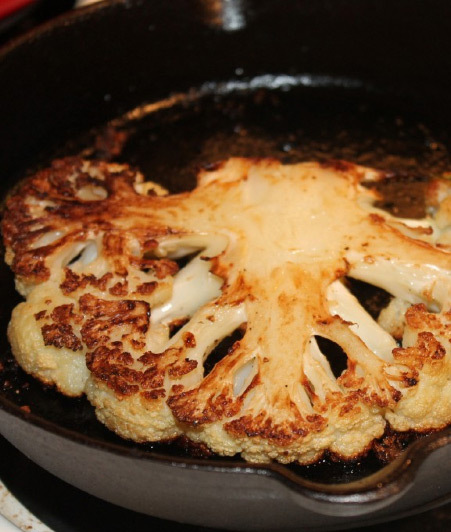 You can cut the remaining cauliflower florets and brown them with the steaks, or save them for another use. In a large nonstick frying pan over medium-high heat, heat your oil. Working in two batches, add cauliflower steaks, season with salt and pepper, and sear 2 to 3 minutes per side until you see a nice brown sear. Only turn once. Remove from pan and place on prepared baking sheet. You may need to add additional oil between batches. Roast cauliflower, in the oven, approximately 15 to 20 minutes.